When a male hummingbird is pursuing a lover, he shows off by dive-bombing 50 mph out of the sky in a U-shaped swoop, intentionally orienting his throat toward the sun so it will glow red, and screaming toward the ground at nearly 400 times body length each second. This is twice as fast as a peregrine falcon, making the hummingbird the fastest-moving vertebrate on earth relative to body size. As it approaches the ground, it spreads its wings and tail and launches into a skyward projectile of 10g-force, or 10 times the gravitational pull of the Earth. Relative to size, that’s faster than the space shuttle’s re-entry into the atmosphere. To put it in perspective, fighter-jet pilots black out or temporarily lose vision above 7g. All to get the girl. Despite their bravado, these flying machines are the love-’em-and-leave-’em type, always looking for the next tryst. The female, in the meantime, builds a tiny nest of twigs and spider webs high up in a tree where it lays eggs no bigger than jellybeans. Dad takes no responsibility for his hatchlings. Most will die within a year; some will live three years or longer. As their mating ritual depicts, hummingbirds are extremists. Their behavior, abilities and physical makeup practically defy reason. They push the extremes of flying, eating, guarding, and even sleeping. 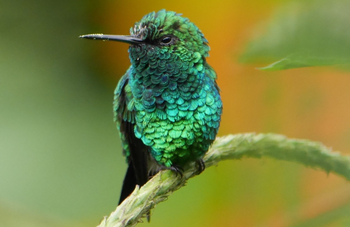 The smallest bird species in North America, hummingbirds only exist in the western hemisphere from southeast Alaska to Chile. The typical hummingbird is just three inches long and weighs less than a nickel, yet it can hover in place, fly forward, upside down, or sideways. It is the only bird that can fly backward. Possessing the fastest metabolism of any animal, the hummingbird’s heart beats up to 1,200 times per minute, and its wings beat up to 200 flaps per second. While at rest, it will take 250 breaths per minute. On an average day, a hummingbird will fly around 25 mph. That’s how fast a ruby-throated hummer flies when migrating across the Gulf of Mexico — for 500 miles, 20 hours, nonstop. And no, it does not hitch a ride on another bird. To maintain this flurry of intense activity, hummingbirds must eat regularly, heavily, and efficiently. Some flowers have actually coevolved alongside hummingbirds to perfectly accommodate their long, slim beaks: as the birds grab their food, the plant gets pollinated. To stay alive, a hummingbird will eat — must eat — anywhere from half to eight times its body weight every day, which is why it licks the nectar of around 1,000 flowers daily with its forked tongue and gulps down insects for protein. Hummingbirds remember the locations of these nectar sources from years prior and protect favorite food patches like warriors. 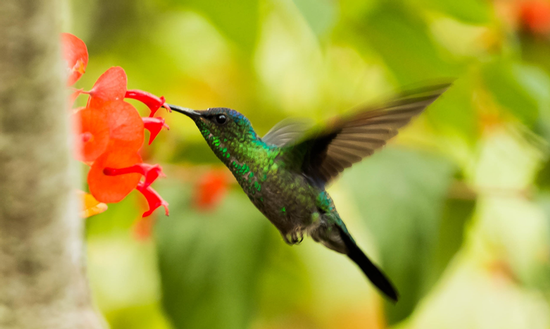 Despite their wee size, hummingbirds are one of the most aggressive birds. They attack crows and hawks that infringe on their territory and may even try to gouge out a competitor’s eyes. Everything screeches to a halt at night when some hummingbirds go into a state of torpor. Body temperature drops precipitously from 107 to 70 degrees. Heart rate plummets to a human-like 70 beats per minute. Hummingbirds in torpor look dead and are occasionally found hanging upside down. While witnessing a hibernating hummingbird is an exception, it’s not uncommon to see them zoom like darts from flower to flower, hover like helicopters, splash in the spray of a fountain, rest under the safety of a leafy branch, tak-tak-tak. Attracting them to the garden is so simple: grow plants with tubular-shaped flowers, hang and sanitize feeders, add a misty water source, avoid pesticides, keep cats indoors. Then sit back and bear witness to extremism at its finest. The whizzing whir of wings, the acrobatic antics, the gleaming iridescence. Staring eye-to-eye with one of nature’s most daring, surreal creatures reminds us how fortunate we are to live where there is an endless bounty of varied, ravishing beauty.